SINGAPORE - Three Housing Board (HDB) blocks in MacPherson Lane have been picked for the Selective En bloc Redevelopment Scheme (Sers), the first such project announced since August 2016. 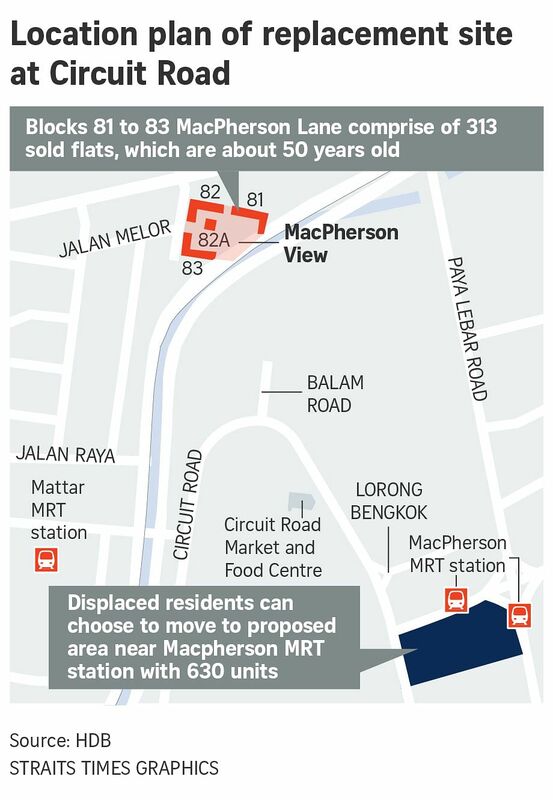 On Thursday (May 31) afternoon, HDB announced the selection of blocks 81 to 83 MacPherson Lane, comprising 313 flats, which are about 50 years old, as well as 27 shops with living quarters, and two eating houses for redevelopment. This is the 81st site under the scheme, which began in 1995, and involves demolishing old blocks, offering residents new units nearby, and redeveloping the old site. Residents of the three blocks, which date back to 1968, will be offered new two-room Flexi flats to five-room units in Circuit Road on fresh 99-year leases. Compensation for the 313 flats will be based on market value at the time of the Sers announcement, as well as payment of reasonable expenses to help in the relocation. These expenses comprise removal allowance of $10,000 per flat and payment of stamp and legal fees. Residents are also assured allocation of a new flat at the replacement site, if eligible. Other rehousing benefits include a Sers grant of $15,000 for singles, or $30,000 for joint singles and families, if eligible, for the purchase of the replacement flat. What if I outlive the lease of my HDB flat? Eligible Sers flat owners may also opt to take up an ex-gratia payment of up to $60,000 on top of their compensation for their flats, instead of the Sers rehousing benefits. Construction of 630 replacement flats, located near MacPherson MRT and the Pan Island Expressway, will start in the third quarter of 2019 and is expected to be completed by the second quarter of 2023. The flats are near the Circuit Road food centre and the MacPherson market and food centre. Registration for new replacement flats will start in the second quarter of 2019. Owners of the commercial properties - the 27 shops and two eating houses - will be given compensation based on the market value of their units at the time of the Sers announcement. They may opt to buy a new unit on a 30-year lease based on selling prices fixed at market value as at the time of the Sers announcement. They may also rent a new unit based on the prevailing market rent at the time of letting, or choose not to take up a new unit and receive an ex-gratia payment pegged at 10 per cent of the market value of the existing unit. The last Sers project involved eight blocks comprising 994 flats in West Coast Road, with residents offered new replacement units in Clementi Avenue 1 and West Coast Link.